We are approaching the 500th anniversary of Lucas Cranach the Younger’s birth. Born on October 4, 1515 (and died on January 25, 1586), Cranach was the youngest and most artistically talented son of Lucas Cranach the Elder and Barbara Brengbier. Cranach the Elder was a close friend of Martin Luther; in fact, Luther was godfather to Cranach the Elder’s daughter Anna. One of the most successful artists in Wittenberg, Cranach the Elder played a significant role in the initial development of a Protestant visual art. Trained in his father’s workshop, Cranach the Younger took over the management of that enterprise after his father’s death in 1553. The Metropolitan Museum of Art in New York has two, apparently pendent, works by Lucas Cranach the Younger and his workshop. Depicting Christ Blessing the Children and Christ and the Adulteress, these oil-on-panel paintings were created between 1545 and 1550. In Christ Blessing the Children, Christ holds one infant in his arm, raising the child up to his lips. He is surrounded by a multitude of mothers, infants, and a few dismayed disciples. My favorite character in this painting is the boy, with the hobbyhorse in the lower left, being pulled along unwillingly by his mother. (Note how she grips him firmly by the arm.) His placement in the composition and his turning towards the viewer makes this child a sort of surrogate figure for the viewer. Giving visual form to reformation theology, Cranach seems to be describing us as undeserving of, and even by nature resistant to, God’s abundant love. Across the top of this panel there is a text, in German, “Suffer the little children to come unto me, and forbid them not; for of such is the kingdom of God.” We should remember that, at this time, the question of what constituted God’s kingdom was a fiercely disputed issue. This painting’s suggestion that the kingdom belongs to children, who have done nothing to merit it, could have been read as supporting a Protestant theology, counter to the courtly places and pageantry of the pope in Rome. Cranach’s theme of salvation by grace is continued in the pendent panel, Christ and the Adulteress. The text across the top of this work reads, “He that is without sin among you, let him first cast a stone at her.” The kingdom belongs not only to stubborn children but also to repentant sinners. When I first encountered this panel, I was struck by Christ’s right hand. In the angle from which we see Christ, his thumb, index, and middle finger are visible. This encourages us to read his gesture as a sign of blessing. In many images of Christ, such as Albrecht Dürer’s Salvator Mundi at the Met, Christ raises his right hand in benediction. His thumb, index, and middle finger are raised while his ring and pinky fingers bend toward his palm. In Cranach’s image, Christ is not only pointing towards the woman, he is blessing her. With his other hand, Christ firmly takes hold of her wrist. There is a sense in this strong grip that Christ is taking charge of her, rescuing her from the soldier behind her. When I first saw this painting, many years ago, I was a bit troubled by how Christ grabs the woman’s arm. This seemed a bit rough and inconsistent with the blessing gesture. Then I had children. Raising children is a challenge that is only exacerbated in a place like New York City. As I walk with my two boys down a crowded sidewalk or as we cross busy a street, I have often reached out and taken one boy in each hand, taking them by the wrist. There hasn’t always been time to take them by the hand. In many situations there hasn’t been time to say, “Give me your hand.” When there is potential danger, I, as father, need to take a firm hold of my child’s arm. 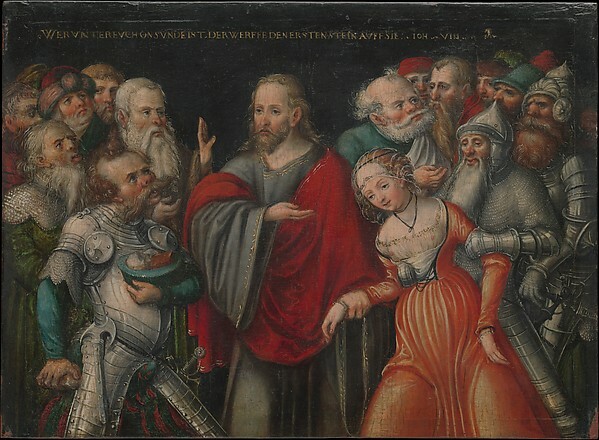 Some years after my first encounter with Cranach’s painting, I was again looking at Christ and the Adulteress and I recognized Christ’s act of taking the woman by her wrist as something I had done countless times. 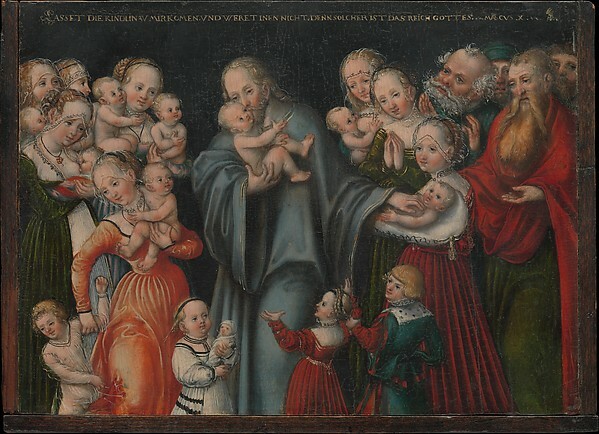 Lucas Cranach the Younger was the father of nine children! I don’t know if he had the same experience with his children as I have had with mine. However, my experience as a father has caused me to see this painting differently. I now read Christ’s firm grip as the loving protection of a father. Together these panels suggest that, in order to know what the kingdom of God is like, we need to know the character of the king. In Cranach’s Christ Blessing the Children and Christ and the Adulteress, Christ the king is a loving father who both takes up his children in his arms to kiss them and, equally lovingly, firmly takes them by the wrist when they need him. Lucas Cranach the Younger and Workshop: Christ Blessing the Children, ca. 1545–50, oil on beech, 6 1/2 x 8 3/4 in. (16.5 x 22.2 cm). The Jack and Belle Linsky Collection in the Metropolitan Museum of Art, New York City. Lucas Cranach the Younger and Workshop: Christ and the Adulteress, ca. 1545–50, oil on beech, 6 1/4 x 8 1/2 in. (15.9 x 21.6 cm). The Jack and Belle Linsky Collection in the Metropolitan Museum of Art, New York City. Lucas Cranach the Younger (German, Wittenberg 1515–1586) was a German painter and designer of woodcuts, son of Lucas Cranach the Elder. His visually compelling style captured the ideas and issues that shaped the Reformation. His work was so closely modelled on that of his father that distinguishing the late style of Lucas the Elder from the early works of his son remains in most cases hypothetical. Having first been his father’s pupil and assistant, he remained in the workshop his entire career. Lucas the Younger became the head of the workshop in 1550, when his father left Wittenberg to join the deposed Saxon elector John Frederick in Augsburg. On his father’s death in 1553, he became sole proprietor and chief artist of this family enterprise. In 1541 he married Barbara Brück, the daughter of the electoral chancellor, Gregor Brück. Widowed in 1550, he then married Magdalene Schurff, a niece of Philip Melanchthon, the following year. Lucas the Younger also followed his father’s footsteps into high civic office. From 1549 through 1568 he served on the Wittenberg city council, rising first to chancellor and then to Burgermeister (mayor). James Romaine is Associate Professor of art history at Nyack College, New York City, USA. He is the president and co-founder of the Association of Scholars of Christianity in the History of Art (ASCHA). Dr. Romaine’s video essays can be viewed on YouTube at Seeing Art History, see https://www.youtube.com/channel/UCGInLlFDxg-GgCEUQkjKwng.